FA People's Cup: Que sera, sera, whatever will be, will be... we're on the road to Wembley! So far we've seen glorious goals, superb skills, tactical team talks, and a fair share of puppy mascots! The grand finale of the 2017 FA People's Cup is underway and 96 teams are descending on Birmingham for a football frenzy Bank Holiday weekend! And, of course, we're bringing you all the action as it happens on Sunday, 30 April and Monday, 1 May, when teams from all 16 categories battle for a chance to win tickets to this year's FA Cup final. Even before the competition began, we had a feeling it was going to be showstopper. More categories than ever, more players than ever (over 40,000) and even more wonderfully imaginative team names than before - some of them had us in stitches here. Whether as part of a team, or as an individual, everyone had a reason why they wanted to sign up - including this team of mums who formed a side after watching their daughters at football training. Team names confirmed, last-minute training sessions finished, it was time for the tournament to begin. Those of you who tune in to Match of the Day, might be thinking, OK, we've seen the action, now we want some analysis. Well, we figured you might think that, so we asked Football Focus front man Dan Walker and football pundit Dean Saunders to step away from the pros for a moment, and give us their analysis of three of our stand-out goals. The FA People's Cup truly is a competition for everyone (so, no excuses not to sign up next year). We've all experienced a bad day in the office at some point, and when you've made a mistake, what you really need is an arm around you and an upbeat, positive chat with a colleague. Well there was no such thing for team Boys from Nancy.You don't want to miss that one! More than 600 teams made the journey home filled with joy, excitement and anticipation. These teams had made it through to the semi-finals. But here at Get Inspired, we're proud of everyone who participated. So, to relive all the action, and maybe catch yourself on camera, check out our first-round catch up. The sun shone brightly on the mornings of the semi-finals. Actually, it was a scorcher of a weekend - which, being British, a lot of the players taking part were quick to let us know! Among the buzzing crowds, players shouting "pass", "shoot" and other words I wouldn't like to repeat here, The Deaf Rhinos, a team from Manchester, were taking in the atmosphere. Coached by a hearing friend who also knows sign language, they say the chance to play competitively is for them like playing in the Premier or Champions League. Much like the sunshine, the football didn't disappoint. The semi-finals saw dramatic penalty shoot-outs, belting strikes from a distance and fiercely competitive knock-out matches. Want to find out for yourself? Check out our round-up of the semi-finals and get in the spirit for the finals with our top 10 moments from round two. So now you're up to speed on events thus far, if you're anything like us, the finals can't come quick enough. It's not only our biggest finals to date, but - with 96 teams, more than 600 players, crowds of supporters, and most likely several more furry mascots - the 2017 FA People's Cup finals are going to be epic! 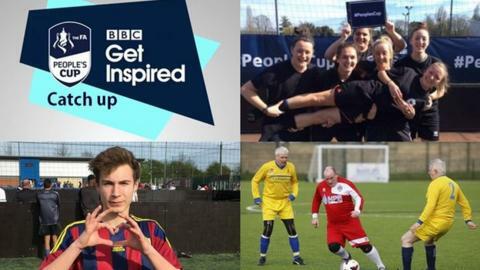 Join us from 11:30 BST on Sunday, 30 April and Monday, 1 May to follow all the action live from the FA People's Cup finals.